I just wanted to pop in with a reminder about our Flashback Finale over at Sweet Shoppe. Today is the final day of our birthday celebration, and we're going out with a bang! All new releases for the month of Feb are on sale for today only. 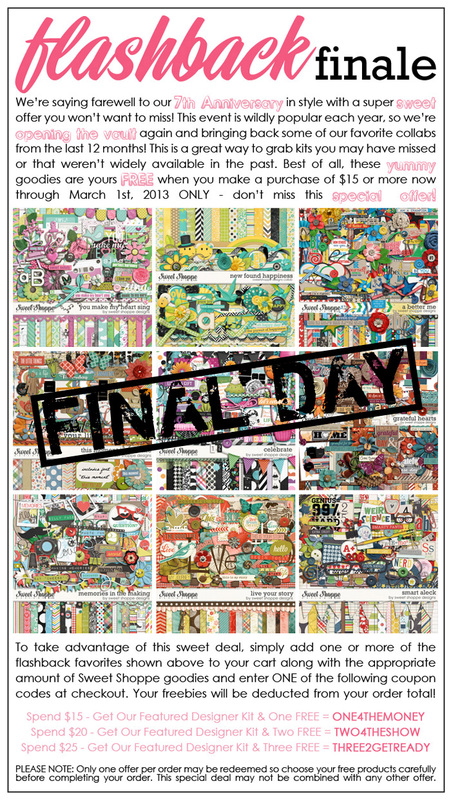 Plus, you can get up to 3 of our Flashback Finale collab kits FREE with your purchase. Today is the last day though, and then these collabs will be gone for good. So, don't miss out! And finally, if you don't follow me on Facebook, you may want to! I currently have just over 4,100 likes on my fan page. If I can get 5,000 by the time the contest ends on April 12, I'll give away a full-size freebie to my facebook fans! On that note, I'm off to the gym! Have a great day!